My experience with Jeff and his real estate team has been very rewarding. The knowledge Jeff brings to the table for both selling and buying properties is invaluable. I accepted an offer on my property in under one week of listing and a successful buy was arranged in about one month. This was made possible due to Mr. Golding’s expertise and knowledge of the condominium market. I am very grateful to Jeff Golding and his team for a very positive experience and will highly recommend this dynamic real estate team to family and friends in the future. I used Jeff for my first purchase and I was very happy with the service that was provided by him, Rod and Angela. This was our second purchase and we decided to buy a house with my parents. We had to sell my condo and my parents’ townhome! At first my parents did not want to use Jeff, they had another realtor in mind. But I convinced them to go with Jeff because I knew that he provided excellent service. Jeff and his team were able to sell my condo in less than a week after it being put on the MLS website. He sold my parents townhouse in 2 weeks and found us our dream home! We are very happy with his service and would recommend him to anyone that is looking to buy or sell! THANKS JEFF, ROD AND ANGELA!!!! Considering the economic climate and a declining market, Jeff and his team were exceptional. They kept me updated regularly, gave relevant information and details that helped us understand the pricing and positioning of our house in the market. It was a tense time for us as we were re-locating and had to sell our house quickly. Even with a tough buyer we were successful and Jeff and his team made a difficult time for us less stressful and a positive result in the end. Jeff was awesome to work with, he was very easy going and there was no sense of pressure. He provided answers to the many questions I had and was very accommodating when it came to my schedule. Jeff was recommended to me by a co-worker and I would not hesitate to do the same. I am very pleased with the outcome! 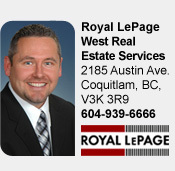 We would like to take this opportunity to extend our sincere appreciation to Mr. Jeff Golding and his staff for the “superb” display of professionalism and “knowledge” exercised during a recent transaction on the sale of our home in Port Moody. Mr. Golding came to us very highly recommended and certainly lived up to his reputation. The sale of our home had unforeseen difficulties and we feel strongly that Jeff’s performance in bringing together the finalization of the sale between the buyers and ourselves helped us out tremendously. Aside from his “evident” knowledge of the “real estate market”, Jeff’s sincerity was evident to us upon our first meeting with him. He truly cares about his clients. I strongly recommend Mr. Jeff Golding as a real estate person to work with in conducting a transaction to either sell or buy a home. On behalf of my husband and myself, I would like to express our sincere appreciation for Jeff’s hard work in the process of selling our house. We couldn’t have done it without him. We wish him all the best and a lot of success for upcoming years. Our warm thanks and best wishes also goes to Angela and Rod, the other members of his wonderful team. Jeff and his team were very personable, professional, honest and always available to answer questions. They were extremely flexible and understanding as our search area changed due to changes in the housing market, displaying their expertise in both the Lower Mainland and in the Fraser Valley. Jeff and Angela went above and beyond to make the purchase of our home as easy as possible. Not only did Jeff assist us in purchasing our first home, he also connected us with valuable resources including our mortgage broker and home inspector. We would highly recommend Jeff and his team to our family and friends! We are very thankful for Jeff’s help in both the selling, and purchasing of our new home. Jeff and his team went above and beyond for us. When we needed something they were there for us. We tried for a good year with one Realtor, and selling on our own, but to no avail. When we finally thought that we had nothing to lose we did our research, went to Jeff’s website, read all the testimonials and were very impressed. We highly recommend Rod McLeod for walking us through every step with the sale of our home and he even helped us to source out a new one. Special thanks to Angela Lam for always being there to answer and return all our phone calls at the office. Thanks again, and we are very happy with our new home! My wife and I recently bought a house from a far. This long distance experience could have been a stressful process, if it was not for the dedication and attention to detail from Jeff Golding and his associates. Jeff and his team worked for us around the clock, which made them available to answer our questions no matter how big or small. If they were unable to answer one of our questions, they took the time to retrieve the info we were looking for and replied to our inquiry in a very efficient manner. The purchase of this home is going to allow us to move back to our hometown and raise our first child in a home that we are proud of. Our first home! This realty experience was stress free and exciting. Jeff and his teammates show a true passion for their profession and we will recommend them every opportunity we have. Thanks again Jeff and team. Thank you for a job well done - very well done! Your professionalism, advice and efficiency was exemplary, thus making the selling of our home after 26 years much easier. We wish you and your team continuing success. I first met Jeff when I went to see one of his listings that he was advertising in my area. Within minutes of arriving at the showing, Jeff was able to determine what I was really looking for, just by asking a few key questions. I went away from that meeting and realized that this guy knew his stuff. Since then Jeff has been my invaluable voice of reason throughout 6 sales/purchases. What really impresses me about Jeff, is that not only is he completely knowledgeable regarding all facets of real estate, he is also upbeat, happy and positive at all times. I always leave each meeting or telephone conversation with all my questions and concerns answered in a clear and concise manner. There is no hidden agenda with Jeff. He is totally focused and committed to providing you with the best possible service and his only mandate is to ensure that you are completely happy with the decisions that you make. Jeff is definitely my realtor of choice for the duration!